Nano Supermarket - What Is Nanosupermarket? 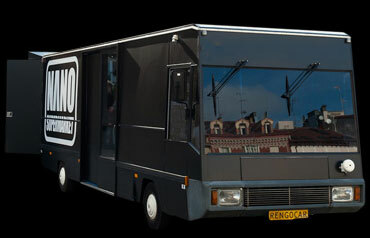 The NANO Supermarket bus received over 75.000 visitors since its opening. Check out the tour schedule for details. Browse through our product collection and create your personal technology profile by telling us which products you would or would not buy. If you are interested in hosting the NANO Supermarket at your event, please contact us. The NANO Supermarket presents speculative nanotech products that may hit the shelves within the next ten years: Medicinal candy, interactive wall paint, programmable wine and more. Our debate provoking products are both innovative as well as uncanny and disturbing. They function as scenarios for potential technological futures, helping us to decide what future we actually want.